Robot War 2 is an action RPG I started way back in the day. 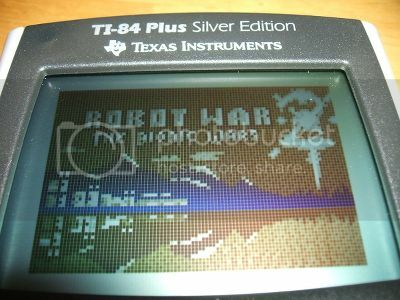 It was originally intended to run under the CrASH shell for what is the now-obsolete TI-82. It was luckily ported to 83+/84+ with help from Spencer (of WabbitEmu/SpASM fame) and several UnitedTI co-conspirators. Story-wise, you play a young student/inventor named Edgar. Years ago, you and your friends saved the world from certain destruction at the hands of a war criminal named Edmund. Sensing a new threat, Edgar voyages to the exotic Pearl Islands to rebuild the institute that trained him. The most striking feature is that the main character has a lot of mobility; and battles take place in real-time. Overall, I wanted to go for very fast-paced and intuitive battle mechanics. Basically for 2014, I'm trying to at least get the introductory "Oceanside" chapters to beta. The game engine, physics, collisions, and non-boss enemies are basically in design freeze. Most of the maps are done too. But, I'd say the story is only 10% programmed (and that's probably a bit generous). Long time, glad to see this project is still going! Ok all caps aside nice to see progress continuing on this awesome project. Can't wait to see the end result!!! Yeah, this project just kept spinning in its own grave. I figured I'd come back if I stood at least a slim chance of finishing it this decade. Wow nice to see you again. I was sad when there was no more news of this, although I understand that people eventually move on sometimes. Glad this is revived, though. Also lol I didn't know you were Digitan000 until tonight. DigiTan! I didn't know that was you! =) You should consider linking your UTI account. Also, this makes me so happy! Robot War 2 and Sonic were probably my two most anticipated projects at UTI! I guess it's a good thing almost all the source code was commented! It took a good weekend or so just to sort out how the app was structured again. I don't know you, but that looks like ... well ... wow I have no words ! The artwork looks fantastic, but I have to admit that my cringe reflex kicked in hard when I saw that particular shade of blue. Wow, it's great to have you back, Digitan! I had no idea that the "Dianzi tian" I was greeting on SAX/IRC was actually you; it's a pleasant surprise indeed that you have reappeared. And of course it's very exciting that Robot Wars is back in some kind of active development. I can't wait to see how this progresses, and rest assured that we'll make sure we do our best to nag-slash-motivate you to carry on. Yeah, it's been a fairly busy time. I figured I would give it another shot after playing some PC indie games like Lake Feperd's Sonic: Before the Sequel. It's a really cool game if you're a Sega/Sonic fan. About the blue effect, for some reason, this only shows up in photographs. I'll admit I have to keep the screen contrast cranked up to reduce the LCD blur. It definitely helps to increase the contrast 3-4 steps from normal levels. Maybe more. Here's the latest sidebar layout. Luckily the design hasn't changed much since the early versions. The displays for gold, skill, and level-ups stay hidden by default until their values change. Fairly recently, the skill (♪) display was changed to a percentage format that counts up until 100%, which triggers a level-up. As you might expect, the requirement to level-up increases exponentially each level. Here's a quick look at the swimming & eating mechanics. Diving into water will drain your health by -1 each second (or thereabout). This happens from the time you splash down to the time your feet hit dry land. Once you're back on terra firma, you get those health points back. Here's some (cringe-worthy) gameplay on the Beginner's Beltway area. This footage is quite old, so there are a couple glitches. Mainly the lack of loot movement. Here's this weekend's mini-project. Testing the (bug-free?) food bonus system! The food items are really handy for fine-tuning your character's combat abilities. Health restore: Recover up to +50% health instantly. If your character already has full health, then the food goes straight to your backpack, which can hold up to 9 items. Depending on feedback, food might restore fixed amounts rather than a percentage. Temporary combat bonus: Gain +10 attack, +10 defense, or +10 speed while the food remains in your stomach. Your stomach holds up to 3 meals in a FIFO manner. Leveling up will gradually deplete your stomach until these bonuses are gone. Permanent combat bonus: Gain +2 attack, +2 defense, or +2 speed on the next level-up, instead of the default value of +1. This bonus is immune to the hunger effect and is awarded randomly based on your stomach content. Hmmmm... This potato idea is intriguing! Here's a quick look at the character interaction system. To complete your journey, you'll need to enlist the help of many characters as you make your way around Pearl Island. To talk to someone, simply bump into them. The game continues running at regular speed throughout your dialog, so watch out for rude enemies! Walking away a certain distance will end the conversation. That's really cool. Hopefully the rude enemies cant hurt the NPCs though!!! © Copyright 2000-2019 Cemetech & Christopher Mitchell :: Page Execution Time: 0.331947 seconds.